Is a top-10 program in ‘hot water’? Speculation is running rampant that a certain Pac-12 program could be facing major NCAA sanctions; is there any credence to these claims, or is it just smoke? Early speculation after this tirade pointed to the University of Oregon, who has had great success on the recruiting front over the past few years, particularly in the state of Texas, where they have plucked blue chip recruits seemingly with ease, including starting quarterback Darron Thomas, starting running back LaMichael James, and running back Lache Seastrunk (Oregon’s 2010 class, per Rivals.com, had Seastrunk, a 5-star RB, and 2 4-star RBs from Texas. Here, check it out: 2010). However, this, if you believe everything you hear, was apparently shot down by Oregon officials who said they have not been contacted by the NCAA regarding violations and were even “surprised” to hear about the rumors. EDIT (3/3): A new report coming out here within the last hour (link) confirms that Oregon is the program under question, and Lache Seastrunk is one of the players’ mentioned in the article (DeAnthony Thomas & Anthony Wallace are 2 players mentioned as well). It’s a good read and just proves the sliminess that surrounds college football recruiting. Is a top-10 program in 'hot water'? And that win would be what I witnessed last night during the Nevada-Boise St. game…an improbable one by Nevada, thus eliminating any and all conversations about Boise St. having a legitimate shot at the National Title Game. I have to give a lot of credit to the Wolf Pack for not losing hope, at one point down 24-7 late in the 3rd quarter, and fighting back, led by one of the best college football players over the last 2-3 years that no one has ever heard of (Colin Kaepernick). However, the best player on the field last night, I believe, was actually Nevada running back Vai Taua, who had 131 rushing yards on 32 attempts & 1 TD (the 32 attempts were a career high). Without him, I can assure you that Nevada would have suffered defeat. The same could be said for junior receiver Rishard Matthews, who had 10 catches for 172 yards (both career highs), and 1 touchdown. He also had 1 rush for 44 yards that resulted in a Wolf Pack touchdown. These 2 guys really stepped up in a huge way and helped send Boise St. back home to Idaho with a loss. So now what happens? Well, Auburn and Oregon will remain 1-2 in the BCS standings. But now, there is no doubt who will be #3 in both the AP Poll and BCS standings, and that will be TCU. They look to be the biggest beneficiary with Boise St. losing and would be the next up, as of now, if Auburn were to stumble against South Carolina in the SEC Championship Game next Saturday. College Football Coaches rising up! My top ten coaches for this year’s college football season. Petersen has Boise going for another undefeated season now only if they could bump into the national title game would it top it all off. He has turned this team around especially the underrated defense. This team who plays in the weaker WAC conference can compete with anybody as they did when they beat OU in the Fiesta Bowl a few years back. I doubt they get to play in the national title this year but if they keep it up like this, Boise could have a shot in the near future. Patterson has done a great job at TCU by thriving with speed on defense in the 4-2-5. TCU’s defense has shown they are capable of matching up with almost anyone they play. The question has always been QB play but so far this year Patterson has helped Dalton become a quality quarterback. TCU could very well be playing in the national title thanks to great coaching and schemes by Patterson and his staff. Nick Saban not only wins football games but usually wins the recruiting battle as well. Saban is known for great defenses and this year has been the very same result. Yes he has lost two games but in the South Carolina game, the Gamecocks made two to three tough plays that ended up leading to their victory. It could have easily been a close game if it wasn’t for those great catches by Alshon Jeffery. Besides that, Saban is stocking up with even more blue chip defensive recruits with next year’s class which could lead to a very strong defense for the Crimson Tide to come. Kelly has this team steam rolling to the national title game out of the Pac 10, which is usually won by USC. Kelly has done a great job of working the zone read and getting his team to buy into his system. Now if he can only get the defense on track then we could be saying Oregon Ducks 2011 national champs. Ohio State seems to always make into the top ten. A lot of that has to go to Tressel and the way he prepares his team. Not only does he stick to the run game but he loves big time playmakers on defense. Yes he does have the conservative style of play and likes to play field position but you really can’t complain with the way he has been winning consistently in the Big 10 or 11. Aggressive gang tackling defenses is what Chizik coaches which has put Auburn at #1 in the nation. He has Auburn playing smart and aggressive defense just as he did when he was coaching at Texas. The offense will hold its own with Cameron Newton at the helm but since Chizik has taken over as head coach this team is primed to be atop the SEC. Bielema has done a quality job with the Badgers. Not only has he done great on the field but off the field as well. In 2009, 21 of the Badgers made Academic All-Big Ten, the highest in school history. As coaches know when you have smart students and mix in football it only adds to success. The Badgers have gone to four straight bowl games under Bielema and he is getting hungrier every year to do even better than the previous year. As long as Bielema is the captain of this ship they should be in good shape. Harbaugh is a player’s coach. He is friendly, funny, and fun to be around. Not only have I met him in person, but he explained the ins and outs of the Quarterback position to the finest of details. With that said, Harbaugh has one of the best, if not the best, QB in the nation in Andrew Luck. Luck has a QB rating of a 162 and is showing that he is primed for the NFL. Harbaugh and company are going in the right direction now they just need to keep it going. Mullen is a fiery coach. He coaches games and practice with passion. He is trying to take the Bulldogs to a whole new level. This year they beat the Florida Gators in the swamp, which to me is a great way in making that step to the next level. He is a quarterbacks coach however, and knows how to get the best out of them. 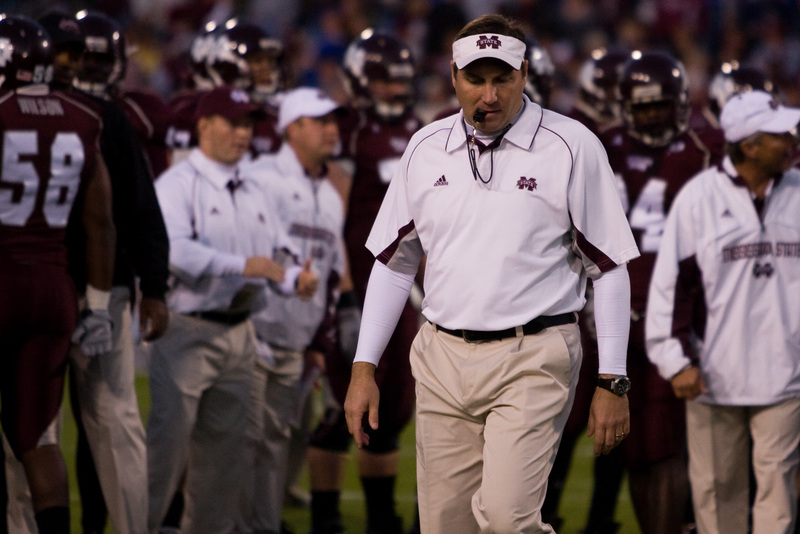 He has coached the likes of Alex Smith, Chris Leak, Josh Harris, and Tim Tebow. Now if he can get Tyler Russell to do the same as he has with others they should be looking at going to bowl games more often than not. The Spartan football program is starting to look like the Spartan basketball program. Well not quite yet but if they can keep winning consistently they could very well be. Dantonio is a defensive minded coach who gets the best out of his players. Take for example current middle linebacker Greg Jones who has risen to stardom with his great play. While he was coaching at Ohio State he did the very same thing by making the 2003 team the number one defense in the country and having thirteen players go pro. If Dantonio can win a few more big games the Spartans could be fighting for the top spot in their conference. The Battle for College Football Supremacy: Auburn or Oregon? Both teams have firmly supplanted themselves as the teams to beat in their respective conferences. Auburn is 9-0, Oregon 8-0. Both have dangerous dual-threat quarterbacks, top-notch running games, and a knack for making the big play on defense. So which team is the best team in the country? I know that Cameron Newton would probably win the Heisman if the award were given out today, but I believe the Oregon trifecta of Darron Thomas-LaMichael James-Jeff Maehl is about as good as it gets. James is an absolute beast of a runner, and Thomas has established himself as a major threat at the quarterback position. Also, having Maehl to throw to certainly does not hurt. He leads the Ducks in ever major receiver category, most notably receptions (45), yards (675), and TDs (9). Auburn, with Newton’s 29 total TDs, is no slouch either. Him and running back Michael Dyer have combined for over 1800 rushing yards and 18 TDs. That is simply unbelievable. Throw in running backs Onterio McCalebb and Mario Fannin, and it’d be hard-pressed to not call Auburn the most explosive rushing committee in the country. Defensively, Oregon is 17th in the country in points against, averaging 17.3 a game. Auburn is 59th, ringing in at 24.3 pts. against per game. I believe the SEC is tougher than the Pac-10, so Auburn gets a slight bump due to the competition factor. All-in-all, I believe both teams are solid and could beat each other on any given day. However, that being said, I think Oregon holds a slight edge over Auburn. I just believe that their combination of size, speed and quickness on both sides of the ball would be too much for the Tigers. Of course, we may just get to see these 2 teams actually battle it out come January in Glendale, Arizona. As a college football fan, one can only hope.